The top-down international development model used by donors, development agencies and policymakers needs rethinking. Not only does it create aid dependence in communities, it often hinders the goal of sustainable development. As an academic, he is plenty equipped to speak about poverty and the lives of the poor. Through his research activities in intercultural communication, he is dedicated to bringing access and transformation to marginalized societies. But when it comes to knowing what underserved communities really need, he prefers to give up his “intellectual superiority” and become a servant to their aspirations and goals, partnering with them in finding solutions. “My privilege — including my class, gender, caste, degree and position — poses a challenge to my ability to understand and address the crisis of poverty and other forms of marginalization in ways people experience it,” said Dutta. Dutta first saw the importance of co-creating solutions while working on a communication design project to promote healthy behaviors in a remote tribal village in western India, while studying at the Indian Institute of Technology Bombay. Dutta says observing several such instances helped shape his decision to formally study communication for social change in an effort to solve problems in more culturally appropriate and sustainable ways. 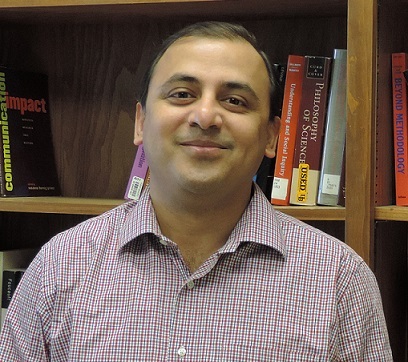 As part of his research at ASU, Dutta engaged with geographically remote tribal communities in eastern India to conduct field research on everyday realities and communication practices. Dutta explained that together as a research collective they met every day to set goals and resolve conflicts. Community members were the key force in identifying and building cost-effective international development solutions using local resources. “For under $5,000, as co-creators, we were able to construct a four-bed mini-hospital, a library that also serves as a museum and a protection wall to save sacred trees and other natural and cultural assets," said Dutta. Computer application with signs and symbols for those who cannot read. Dutta also collaborated with community members to co-develop a computer application to help those who were illiterate access useful information regarding local weather, employment, education and other basic services such as health care. “The information is conveyed through sounds, pictures, symbols and signs they can understand,” he said. Another computer application under development would allow villagers to record and preserve their culture, art and craft on their own. “Using this, they can record their traditional songs, folklore and paintings, and take videos of their dances and performances. Soon they will no longer need outsiders to tell their stories for them,” Dutta said. To pay for the raw materials and resources for these research initiatives, Dutta used funds he received during his doctoral studies in communication at Purdue University, as well as start-up funds he received as a new faculty member at the Hugh Downs School. Dutta says that these projects demonstrate that empowerment does not come from outside, but from within.